Congratulations to Gaelynn Lea, the winner of the 2016 Tiny Desk Contest! There were 6,100 entries in this year's Tiny Desk Contest, representing every state in the nation. We asked you to send us a video of an original song, behind a desk of your choosing. We didn't care much about the quality of the video or even the sound. We wanted something singular, a song and a sound that felt original and a performance that felt inspired. We at NPR Music watched all of those 6,100 entries and in the end our six judges — Dan Auerbach of The Black Keys and The Arcs, Holly Laessig and Jess Wolfe of Lucius, Son Little, Robin Hilton and I — found one artist so compelling we're thrilled about this announcement. Our winner is a haunting fiddler from Duluth, Minn. Her name is Gaelynn Lea. Holly Laessig said it best: "Hers was the one melody that stayed with me throughout the process. It's captivating and powerful." Robin Hilton, my cohost on All Songs Considered, said, "Gaelynn Lea had the most arresting voice and overall sound I heard in this competition. While judging each entry, I'd listen to the song first, then watch the video if I was moved by the music to spend more time with it. I was profoundly moved by Lea's song, particularly its serpentine, earworm melody and the tremendous heartache in her poetry." Gaelynn is a 32-year-old classically trained fiddler whose music is steeped in Celtic tradition and American fiddle tunes. Her fiddle style is shaped by those traditions but also the challenge she has, playing an instrument that is almost as large as she is. Gaelynn was born with brittle bone disease, a congenital disability that makes playing the violin tucked tightly under the chin not a comfortable option. Instead she plays it upright, as a cellist might. In the original tune she submitted, "Someday We'll Linger in the Sun," Gaelynn creates a beautiful droning loop with her JamMan Express loop pedal and after a moody minute begins to sing a yearning tale of life's preciousness and time's constant ticking and why we should always care. "Don't tell me we've got time / the subtle thief of life / it slips away when we pay no mind," she sings in a somewhat childlike and haunting voice. She ends with the phrase, "Someday we'll linger in the sun / And I love you." That's such a universal message — simple, thoughtful and relatable. Truth be told I saw musicians with better craft than Gaelynn, heard singers more capable. That was true of last year's winner as well. Skill and craft is a part of how we select a winner. What Gaelynn Lea did for all of our judges, myself included, was to make something memorable. 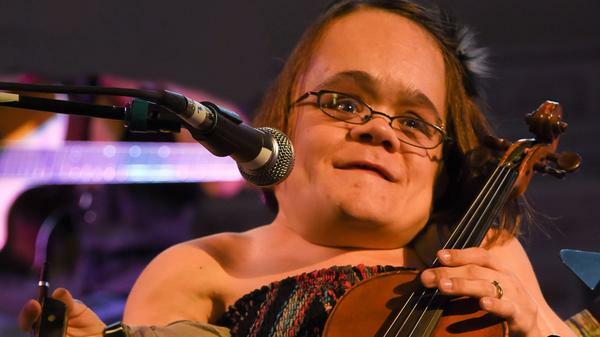 As Jess Wolfe put it, Gaelynn Lea created something "so unusual/beautiful and like nothing we've ever heard before." After I voted, I spent some time trying to find out more about Gaelynn Lea. I learned about her congenital disease; I learned that she was a fiddle teacher and that she plays many of the same fiddle tunes my son and I have played together in Irish music camps and for contra dances. I also learned something I hadn't expected: One day while playing at a farmers market in Duluth, Alan Sparhawk, the guitarist and singer of the band Low (also from Duluth) heard Gaelynn Lea playing. Shortly after he texted her, asking if she'd like to play together. It was the beginning of a musical friendship. That friendship is a casual one they call The Murder of Crows. I discovered that they'd made a record together back in 2012 called Imperfecta. Working with Alan helped Gaelynn envision and shape her sound. Fans of Low might be able to hear that band in the way her music unfolds, slow and mysterious, every moment existing for each moment to come. I love this. I love the way musicians change and shape each other and open ideas that might not arrive naturally but become part of a vocabulary of expression. My hope with the Tiny Desk Contest and concert series has always been about discovery, about finding music outside our comfort zone. One day there might be Adele, the next day a Colombian jazz harpist or a punk band from Detroit. We want you to hear something new and inspiring, something which moves you in some way, makes you think of something — in this case, the preciousness of time — in a way that may cause you to be more appreciative, more thoughtful, more expressive, be it musically or personally. Gaelynn Lea's music felt like a perfect gift. You know, one of the exciting things about working here at NPR is you get to go upstairs from time to time and watch bands and artists perform behind this tiny desk. You know people like Adele and Tom Jones and T-Pain, but there are also many up-and-comers. And last year, we started a contest for people who were unknown, and we asked them to submit their music to try and win a chance to come perform a Tiny Desk concert here at NPR. And we're about to announce this year's winner, and I honestly - and say I honestly - do not yet know who it is. NPR All Songs Considered host Bob Boilen does, and he's here to introduce the winner to me and to you. And Bob, the floor is yours. BOB BOILEN, BYLINE: I have brought you a video. We received over 6,000 submissions. GREENE: Which is really cool. BOILEN: This is the one six judges independently loved. And I am floored and so thrilled to do this. So - you ready for this? BOILEN: OK, here we go. BOILEN: So we see a little baby amplifier sitting on a desk. We see somebody playing a violin. GREENE: Playing a violin, but we only see what, her left hand? GREENE: We don't see her face and don't see the rest of the instrument. GREENE: All right, it says Gaelynn Lea across the top. I'm presuming this is - I mean, that's how we sort of knew this is a woman. We don't - we haven't seen her yet. The camera's panning out. GAELYNN LEA: (Singing) Our love's a complex vintage wine, all rotted leaves and lemon rinds. BOILEN: Gaelynn Lea is holding her violin with their feet at the base of the violin. The violin's about the size she is. GREENE: Wow. She has a medical condition, I gather. BOILEN: Yes, it's called brittle bone disease, a congenital disease she was born with. But the way she plays the violin, which is more like - it's like a cello - right? - in her body. The way she caresses the violin is only possible because of the way that her body is. GREENE: Because of her size, she's almost using a violin as if it were a large cello. LEA: (Singing) Don't tell me we've got time. BOILEN: So Gaelynn Lea is a fiddle teacher and obviously a performer. She's from Duluth, Minn. She's been playing classical music and fiddle music for about 20 years. She's 32. BOILEN: I haven't, but I think some of the judges didn't watch the video at all and just listened to the music. I think it was intentional that you be taken in by the music before you looked at her and thought oh, that's amazing that she's able to do that. BOILEN: We all found the melody in the song - it wouldn't let go. It just stuck with us. And that's - I mean, that's why she won. More than anything, she was able to convey something that was not forgettable. GREENE: And so what happens now? BOILEN: Well, Gaelynn Lea's going to come and play a Tiny Desk concert here - upstairs at NPR. And a lot of people who would have never, ever seen or heard her music will be blessed by this beautiful, beautiful sound. GREENE: I can't wait to meet her. And you, our listeners, will also be able to hear Gaelynn Lea herself tonight in an interview with All Things Considered, and you can watch her winning submission online at npr.org. Bob, that is quite a video, and she seems like quite a musician. Thanks a lot. BOILEN: Thanks. Transcript provided by NPR, Copyright NPR. 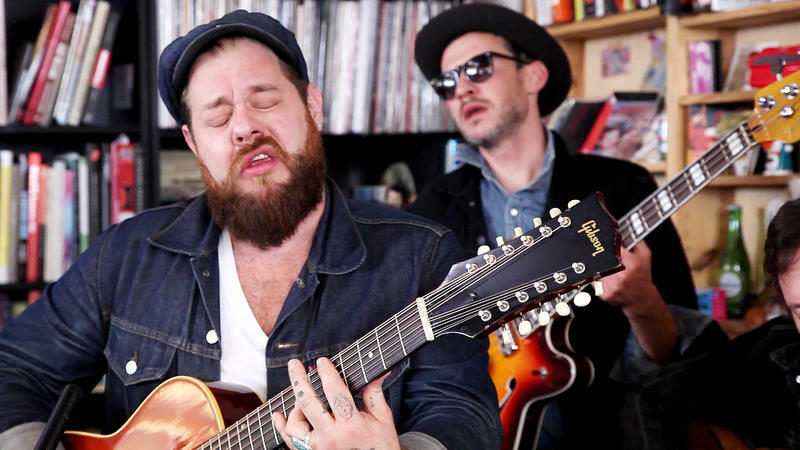 Show us why you should perform in NPR Music’s Tiny Desk Concert series! True to its spirit of music discovery, NPR Music is kicking off 2016 with an invite to unsigned artists of all genres: Show us why you should perform in NPR Music’s Tiny Desk Concert series. The winner will secure a spot at the iconic performance space and a U.S. tour with NPR Music.